While doing research and collecting data to develop a collaboration product, the Sony team traveled to more than a dozen universities and corporate clients around the globe, some commons themes emerged. First and foremost, the product needed to have an easy-to-use UX, and it needed to be flexible and scalable. This approach was a perfect fit for the University of Manitoba, and the University of Saskatchewan (U of S), clients of Calgary-based integration firm, Matrix Video Communications. “Sony Vision Exchange can expand and mold to however you see fit,” says Kyle Berezowski, CTS, consultant, Equipment Services, ICT Client Services at U of S.
“What I like about this story is that it’s not the product planner or the managers that brought in some product,” says Tada. “It was pure engineering doing development and figuring out how we can use a really big canvas and create a very simple user interface.” Whether the solution is used for interactive lecture, active learning, a conference room, or a huddle space, “we have one simple user interface that people can easily use,” says Tada. Through two case studies, learn more about how Matrix Video Communications’ two university clients chose and implemented Sony’s Vision Exchange. 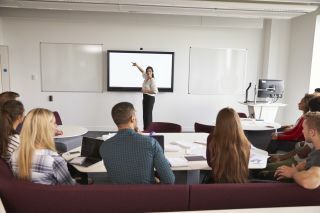 This is the sixth in a six-part blog series in which I will focus in on the bleeding edge of active learning in higher ed today. Read my first post here: Just Make it Easy to Use!